The molar volume, symbol Vm, is the volume occupied by one mole of a substance (chemical element or chemical compound) at a given temperature and pressure. It is equal to the molar mass (M) divided by the mass density (ρ). It has the SI unit cubic metres per mole (m3/mol), although it is more practical to use the units cubic decimetres per mole (dm3/mol) for gases and cubic centimetres per mole (cm3/mol) for liquids and solids.  Change in volume with increasing ethanol. If the sample is a mixture containing N components, the molar volume may be approximated as the sum of the molar volume of its individual components, using the density of the mixture. However, many liquid–liquid mixtures, for instance mixing pure ethanol and pure water, experience contraction or expansion upon mixing. This effect is called "excess volume". 6998247895980000000♠0.024789598(42) m3/mol at 25 °C. 6998244650000000000♠0.024465 m3/mol at 25 °C. where NA is the Avogadro constant and Z is the number of formula units in the unit cell. The result is normally reported as the "crystallographic density". Silicon is routinely made for the electronics industry, and the measurement of the molar volume of silicon, both by X-ray crystallography and by the ratio of molar mass to mass density, has attracted much attention since the pioneering work at NIST by Deslattes et al. (1974). The interest stems from the fact that accurate measurements of the unit cell volume, atomic weight and mass density of a pure crystalline solid provide a direct determination of the Avogadro constant. At present (2006 CODATA recommended value), the precision of the value of the Avogadro constant is limited by the uncertainty in the value of the Planck constant (relative standard uncertainty of 6992500000000000000♠5×10−8). The 2006 CODATA recommended value for the molar volume of silicon is 6995120588349000000♠12.0588349(11)×10−6 m3/mol, with a relative standard uncertainty of 6992910000000000000♠9.1×10−8. ^ "CODATA value: molar gas constant". NIST. Retrieved 2017-07-24. ^ Deslattes, R. D.; Henins, A.; Bowman, H. A.; Schoonover, R. M.; Carroll, C. L.; Barnes, I. L.; Machlan, L. A.; Moore, L. J.; Shields, W. R. (1974). "Determination of the Avogadro Constant". Phys. Rev. Lett. 33 (8): 463–66. Bibcode:1974PhRvL..33..463D. doi:10.1103/PhysRevLett.33.463. ^ a b Mohr, Peter J.; Taylor, Barry N. (1999). "CODATA recommended values of the fundamental physical constants: 1998" (PDF). Journal of Physical and Chemical Reference Data. 28 (6): 1713–1852. Bibcode:1999JPCRD..28.1713M. doi:10.1063/1.556049. Archived from the original (PDF) on 2017-10-01. ^ a b Mohr, Peter J.; Taylor, Barry N.; Newell, David B. (2008). "CODATA Recommended Values of the Fundamental Physical Constants: 2006" (PDF). Reviews of Modern Physics. 80 (2): 633–730. arXiv:0801.0028. Bibcode:2008RvMP...80..633M. doi:10.1103/RevModPhys.80.633. Archived from the original (PDF) on 2017-10-01.